Extracted wax gland scent located inside the cleft of a buck’s hoof. 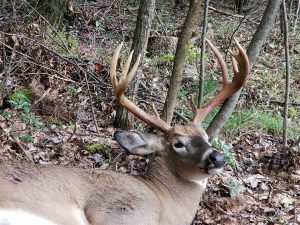 Buck Interdigital Gland gives off a strong musky odor leaving a natural scent trail that other deer can follow. 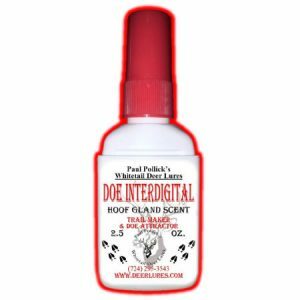 This an excellent trail scent to use at mock or natural buck scrapes and at sign post tree rubs to authenticate another buck’s presence. Use it anywhere to leave a natural buck trail. 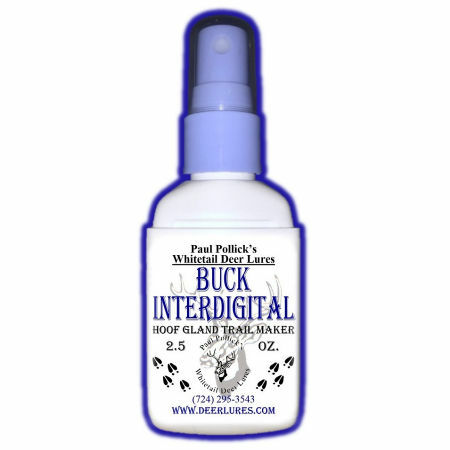 Buck Interdigital is a natural regrouping trailing deer scent good in late archery or musket seasons. I just wanted to have a minute and say thank you for such a wonderful product, (Buck Interdigital)! I have used it for two years now and will use it for as long as I can. I have several friends and a believer of a brother who asks me every year, “Where do you get that stuff?”. Well perhaps I will tell them of keep them guessing! But I can tell you this…it works!!!! 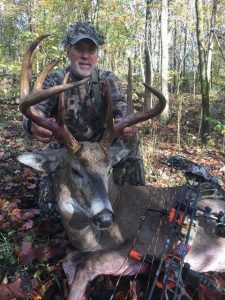 Just got back from Ohio bow hunt using your Buck Interdigital. 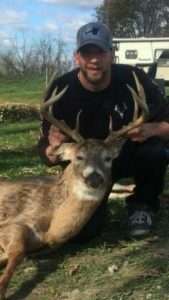 I was able to have a beautiful 10 pt walk within 12 yards. Just wanted to, again, say thanks. I’ve arrowed another nice buck coming into mock scrapes made with your product. 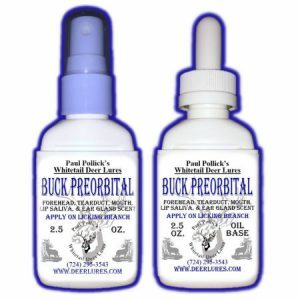 This year, I purchased a new bottle of Buck Interdigital and your new oil based Buck Preorbital. Video after video, both bucks and does are coming to the scrapes, smelling the soil and licking the branches. It sure makes knowing what deer are in the area a lot easier. 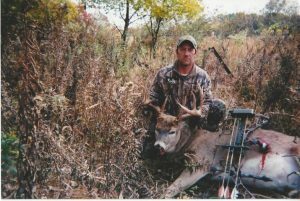 Here’s a pic of the 6 year old, 200+ pound bruiser I arrowed on 11/14/15. 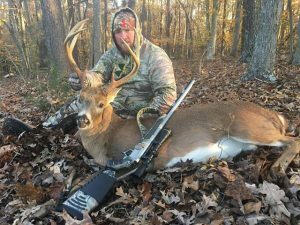 A true beast for north Alabama…especially considering the rut is still a month away! Paul I would like to thank you. 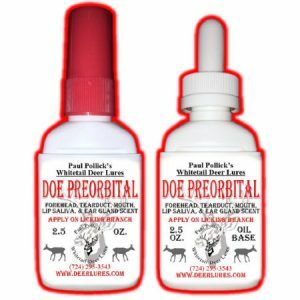 I used your Buck Preorbital Gland Scent and Buck Interdigital Gland Scent to start my mock scrapes in August. It worked like a champ. 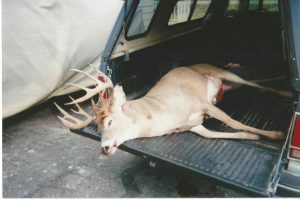 I shotthis eight pointer at 30 yards. 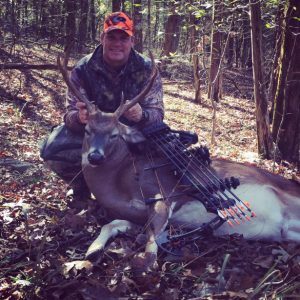 First day of Archery on 10/3/2015. 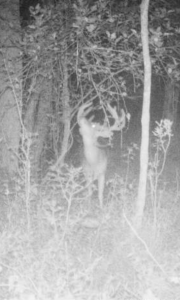 I had two cameras up on my lease since August and I never had one picture of this buck. I used your Oil Based Buck Preorbital and the Buck Interdigital on a mock scrape starting early January, as the rut starts really late here in South Alabama. 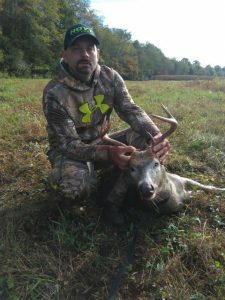 He came out from a thicket into a cotton field in response to rattling and once he saw no other deer he continued into the field going away from me and getting further out of range. Once he was down wind from the scrape he made a beeline for it and came close enough for me to get a shot. Thanks for producing a great product! 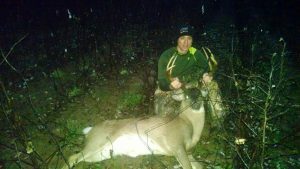 I failed to mention the 6 pointer I killed as well. 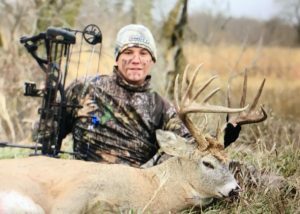 I had a scrape dripper set up on his scrape line and photos of him nearby. 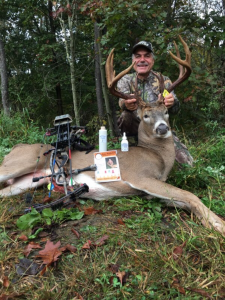 I used the same products on his scrapes as I did for the 8 pointer. I have used other products but never with any success, until now. You really have an excellent product. I will be placing another order with you for sure. So much for the October lull, 218 lbs. field dressed. Came in to a mock scrape at 20 yards.